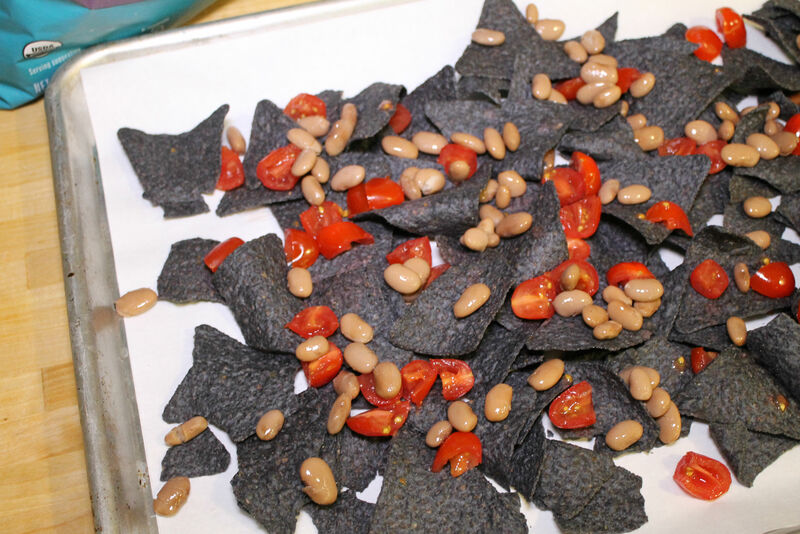 Nachos are a favorite food for game day, a group get together or for a quick weeknight meal. The beauty of these bean and veggie nachos, aside from great nutrition, is the lack of cooking required. All you have to do is layer all the ingredients together and pop it into the oven. You will have to chop some fresh ingredients and shred a bit of cheese, but in less than ten minutes you can have dinner in the oven. Back in our college days, a group of us would head to a particular local sports bar to devour an absurd portion of their chicken nachos. It was a huge oval platter with a pile of multi-colored tortilla chips, loaded with chicken, cheese , sour cream etc… I think I would faint if I knew the nutrition facts about that meal now. In my defense though, it was college. So here is to a healthier and vegetarian version of the nostalgic college nachos. The ingredients are simple and fresh. You can add or subtract things to your liking as well. Jalapenos would be a great addition if you like things on the hotter side. On previous occasions I have used raw onion and bell peppers too, just make sure to finely chop them so that they cook during the short window of time in the oven. This recipe is also a great way to use up part of an onion, pepper or tomato leftover from another recipe. 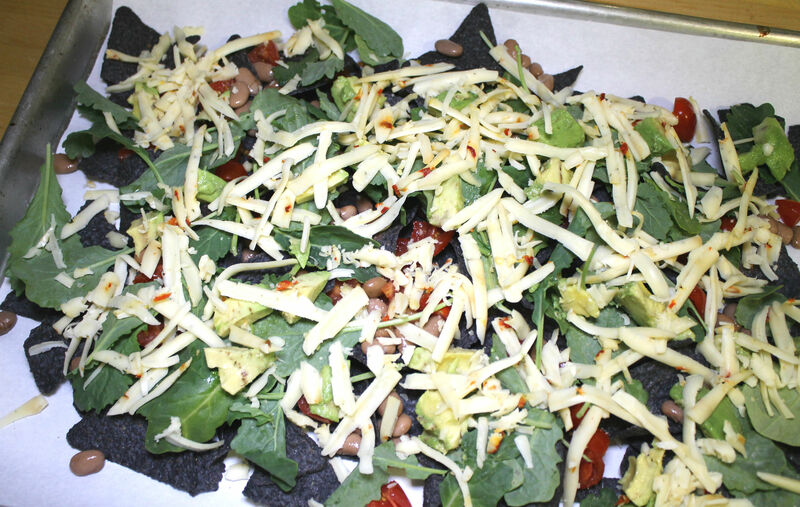 I layer my nachos on a baking sheet so I can distribute things quickly and evenly. Line the pan with parchment for easy clean up! Start by scattering a few handfuls of your tortilla chips among the pan in a fairly even layer. Add the quartered grape tomatoes next, followed by the pinto beans. Again, if you prefer a different kind of bean than swap it out. Make the recipe the way your family will like it! I added fresh baby kale and cubed avocado next. Try to scatter the toppings so every bite will have something yummy. Lastly, add the shredded Monterey Jack to your nachos and pop them into a 400 degree oven for 12 minutes or so. 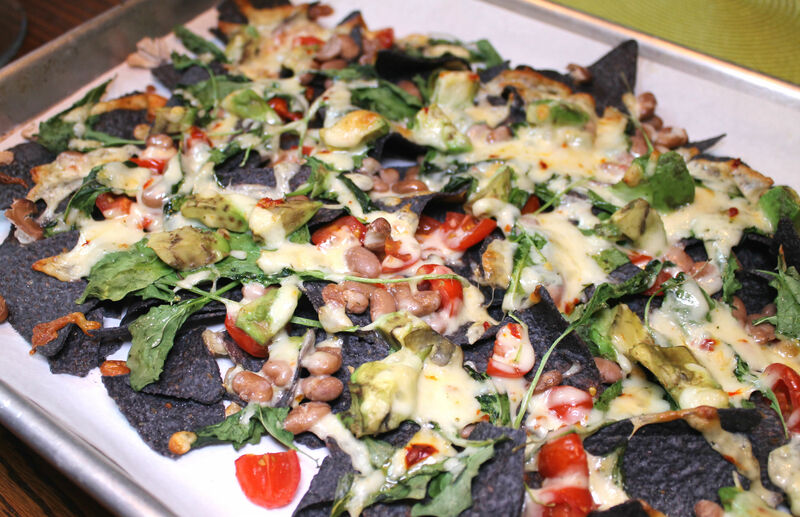 A healthy and vegetarian nacho recipe with pinto beans, avocado and Monterey Jack cheese. 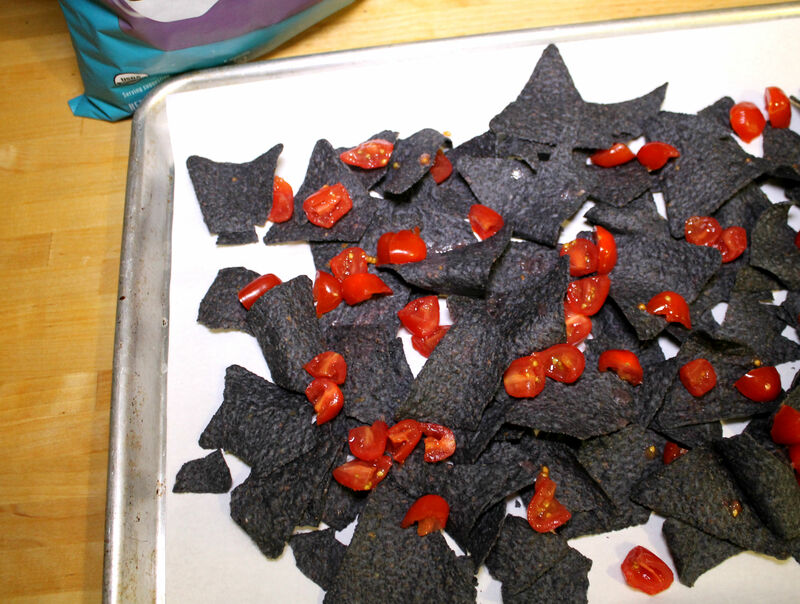 Spread the tortilla chips on a baking sheet lined with parchment. 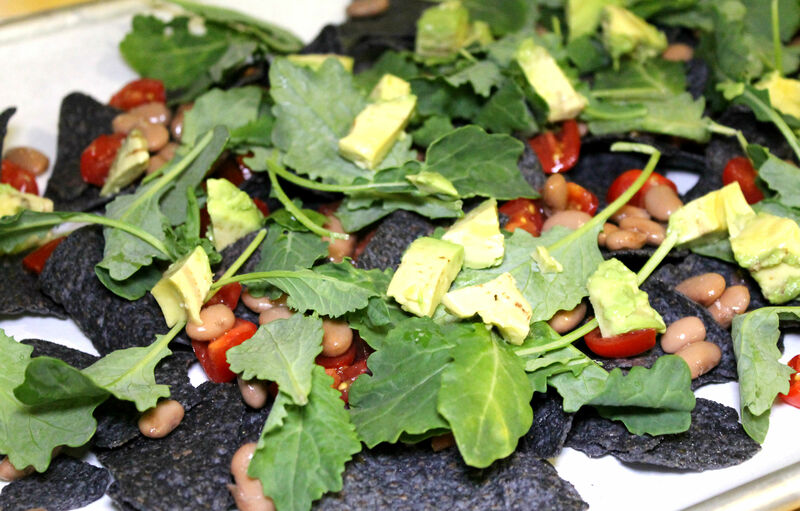 Distribute the tomatoes, pinto beans, baby kale and cubed avocado among the chips evenly. Top the nachos with shredded Monterey Jack cheese. Bake for 12 minutes or until cheese is melted throughout. *Add optional toppings before topping with the shredded cheese. One Response to "Pinto Bean Nachos"